But researchers said wearing the so-called ‘smart glasses’, which include a screen and a speaker, helped kids better understand and identify the emotions on people’s faces. The wearable computer glasses are paired with a smartphone and feature a camera that records the user’s point of view. First, when a face is detected by the glasses’ camera, an emoji appears in the display corresponding with the emotion. Then an audio cue is given that classifies the emotion as one of eight: happy, sad, angry, scared, surprised, disgust, ‘meh’ and neutral. Then there are three games that parents can play with their child. The first is the ‘capture the smile’ game, in which the child is given clues to elicit a certain emotion, such as telling a joke for the happy emotion. In ‘guess my emotion’ game, parents have the child guess which of the eight emotions they’re acting out. Then there’s ‘free play’ in which the child is given audio and visual cues for the emotions of any individual who is interacting with them. The researchers say these games help autistic children learn to identify and understand different emotions. Forty children used the device for 20-minute sessions four times a week for a total of six weeks and the rest were controls. After the study periods, researchers saw improvements of scores in SRS-II, which is a questionnaire completed by parents of their autistic children’s social skills, meaning autism symptoms improved. There were also improvements in the Emotion Guessing Game, which had children identify emotions that were being expressed by a live human actor. The authors say the average wait time for a specialist in the US is currently 18 months and that early autism therapy is effective, but can cost between $40,000 and $60,000 per child per year. 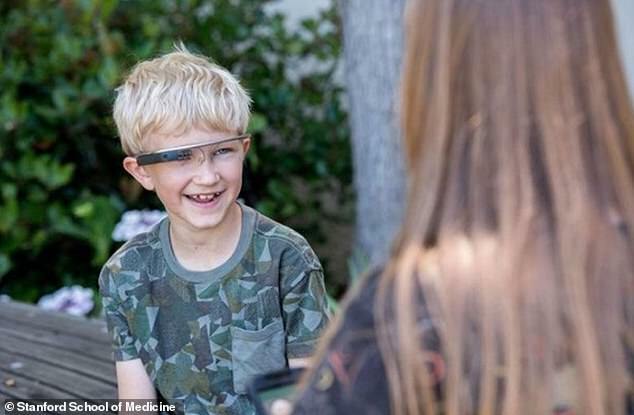 Co-author Dr Dennis Wall, an associate professor of pediatrics and psychiatry at Stanford University, told MD Magazine that the findings provide hope that smart glasses could be standard treatment in autism care. ‘We certainly think that there is great purpose and potential to be used while children are waiting for access to the current standards of therapy that are administered today,’ Dr Wall said.